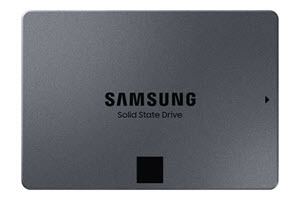 Samsung Electronics America, has unveiled its new consumer solid state drive (SSD) lineup — the Samsung 860 QVO SSD — featuring up to four terabytes (TB) of storage capacity with exceptional speed and reliability. Built on the company’s high-density 4-bit multi-level cell (MLC) NAND flash architecture, the 860 QVO makes terabyte capacities more accessible to the masses at approachable price points. Featuring sequential read and write speeds of up to 550 megabytes per second (MB/s) and 520 MB/s, respectively1, the 860 QVO achieves the same level of performance as today’s 3-bit MLC SSD, thanks to Samsung’s latest 4-bit V-NAND and the proven MJX controller. The drive is also integrated with Intelligent TurboWrite technology2, which helps to accelerate speeds while maintaining high performance for longer periods of time. Based on a thorough analysis of consumers’ SSD usage patterns, Samsung has designed the drive for optimal reliability: a three-year limited warranty3 or up to 1,440 terabytes written (TBW) for the 4TB version, and 720 TBW and 360 TBW for the 2TB and 1TB versions, respectively. The 860 QVO will be available on December 16, 2018, with a manufacturer’s suggested retail price (MSRP) starting at $149.99 for the 1TB model.